Initial media reactions to UKIP’s local election results have been slightly tempered by various well informed commentators pointing out that their performance probably wasn’t that much better (perhaps even worse) than in the 2013 locals. We’ll see on Sunday night whether they’ve topped the Euro poll. If not, I think Thursday’s results will come to be seen in a whole different light by the rest of the commentariat. The price on them to win a seat has moved significantly in from 4/5 to 1/2. It’s hard to believe that Farage on his own won’t be odds on once he picks his seat (South Thanet most likely, according to the odds). And there are several other extremely plausible targets in Rotherham, Grimsby, Eastleigh and plenty of places in Essex and Kent. The mid point for their predicted vote share is around 12%, according to Ladbrokes’ odds. If they turn out not to have won the Euros and then fail to win or get close in Newark, I expect there will be a lot of talks of bubbles bursting. Could Darling get back to No.11? 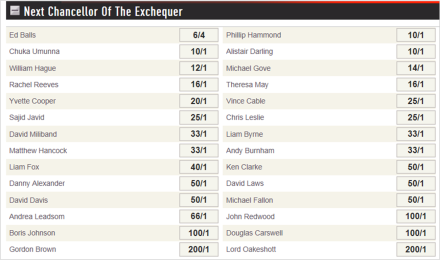 One other bit of betting activity that caught my attention – a customer in one of our London shops put down £500 on Alistair Darling being the next Chancellor of the Exchequer at 16/1. I wonder if they are thinking that Balls would be unacceptable to the Lib Dems in a possible Lab/Lib coalition government? We’ve cut his price to to 10/1.